He Golfs, I Scrap: VA Hospital Holiday cards! This cute snowman and snowflakes are from Sizzix and Hero Arts Stamp & Die-Cut #657781. 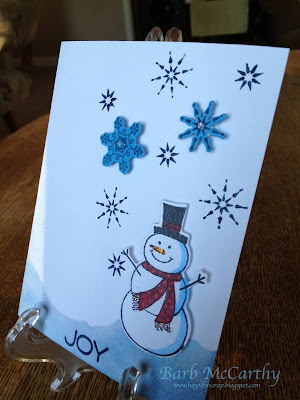 I used Stampin' Up ink, Copics, and Ranger's Diamond Stickles! ah! :Yea! and a spot for personalization, too! Way to go, girl, for the VA, those who stood for our freedom to stamp and live life full.